Contract-to-Hire Services give clients the ability to monitor the work performance of a employee prior to making a formal offer of employment. This allows client to manage expenses, put extra resources where they need them most and use permanent staff most efficiently. 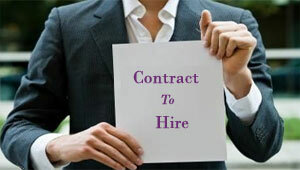 We allow clients to hire employee on contract-to-hire role with flexible payment terms. after a specific period of time, client can hire contract employee into their permanent payroll. We try to understanding of the client's recruitment needs. Requirements analysis to handle requirements and responsibilities. Find out best professionals across domains who meet the specific requirements of the clients. Quick response time to clients requirements with available resource pool. Set up interviews for short-listed candidates. Contribute to the decision making process of the Clients HR Team. Post-Contract follow up and support that allows for on-the-job feedback and adjustments. Quick replacement of the resources on need basis.